I leaned against the railing of the cabin's balcony and looked up at the muted sky. The morning was so still that I could hear a hundred variations of silence. Low moans carried from the direction of the distant city. The quiet stirrings of nearer creatures also were startlingly amplified; I heard the squeaking footsteps of an animal as though it was walking right in front of me, although it may have been a half mile away. The cold air itself seemed to emit the ever-so-faint harmony of chiming. I imagined ice particles brushing against each other like tiny glittering bells. 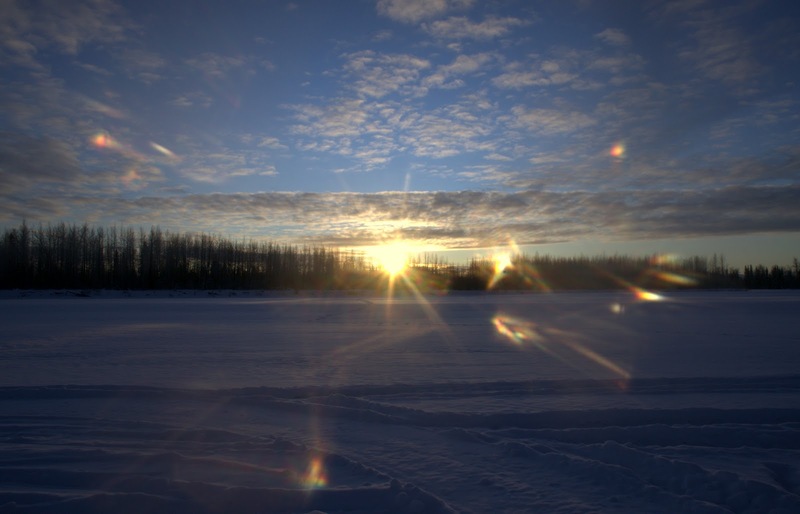 The proprietors at Luce's Lodge were very sweet and got up at what is an ungodly early hour in Alaska's December — 7 a.m. — to make us a huge breakfast of eggs, meat, pancakes, coffee and orange juice. We wolfed it down as Anne urged us to load up on butter because, "in these temperatures your body needs fat." Although I'm of the opinion that fast-burning carbohydrates are still the best fuel source for both heat generation and energy, and don't even particularly like butter, I slathered it on anyway. I wanted all the help I could get. The porch thermometer still read 20 below — a small grace offered by the cloud cover that moved in overnight, because it could have dropped a lot lower. I asked the proprietor what he thought that meant for the temperatures on the trail. "Definitely 30 below," he said. "Probably 35 below in spots. There are some cold holes on the river." I have what I feel is an adaptable but effective outfit for a wide range of cold temperatures. Over the years I've ditched all of my wool for synthetic layering head-to-toe. Synthetics in my experience are more forgiving when damp and also dry faster. For a base layer I wear a polypro shirt and light fleece tights. The mid-layer is a furry fleece jacket and wind tights. On top of that goes the down skirt and a Gortex shell. I've used soft shells in the past but I prefer Gortex because it's such an effective wind blocker, and this one has lots of zippers for venting. If I begin to overheat, I just open up the full-length pit zips and chest zipper, and effectively pour the excess moisture out. I also naturally vent a lot through my head and hands. This results in crazily iced up balaclavas and hats, but these things are "cheap" weight-wise, and I can afford to carry a few extra to exchange after one becomes damp. I still rarely change these out because fleece hats are warm even after they've turned to ice helmets. For my hands, I used a pair of pogies on my trekking poles that Beat sewed out of a synthetic sleeping bag. In non-windy conditions, the pogies were all I needed. They enabled me to go bare-handed for nearly the entire trip, 35 below and all, which is why I was able to take so many photos and stuff my icy face with so many tasty carbohydrates and sips of water from my deeply buried Camelback vest. Photo-taking and food are my best coping mechanisms — the key to feeling healthy and happy the entire time. On my feet go Drymax socks (pure, blister-preventing gold), fleece socks and vapor barrier socks, with Gortex trail running shoes and knee-length winter gaters. Even with my prior frostbite damage, I never had issues with cold feet. On the morning of 35 below, I did add a primaloft puffy sweater to my ensemble. This proved to be unnecessary and ultimately a mistake of overdressing, but I didn't realize it at the time. I mean, really, it was 35 below. Sure enough, as soon as we dropped onto the river, the temperature fell from "dark side of the moon" to "outer space" levels. It definitely felt 15 degrees colder. Anne announced that she was going to have to "trot" to stay warm, which meant she would be running. I tried to follow her lead, but the heavy breakfast sloshed in my stomach like a load of bricks, and I quickly grew dizzy from the effort. I pulled out my GPS to see what speed I was "running" atop the loose sugar snow: 4.2 miles per hour. If I really amped up I could push it to 4.5, but that felt like full-intensity sprinting. Everything moves slower at 35 below, but the energy inefficiency of trying to "run" in these temperatures, on this terrain, was almost baffling. I'd have to expend twice the energy and muscle effort for a measly one extra mile per hour. I yelled out to Anne that I was never going to keep up. She agreed to meet us at an off-trail oasis called the Northwoods Lodge, which she thought was about 20 miles away. She didn't know what it looked like or exactly where it veered off the trail, only that "there's probably a sign." Beat didn't seem to mind the walking pace, but he did appear uneasy with the temperatures, which trickled into our clothing like ice water every time we stopped. Steep river bluffs walled us in, trapping cold air like a prison. When we passed side canyons and sloughs, a stream of new cold air would hit us like a blast from an air conditioner. Even the creeping daylight did little to warm the morning. After six miles we passed a friendly sign advertising coffee and food. Anne's footprints indicated she clearly went on without stopping. Beat started walking toward the building to make sure Anne's footprints weren't up there. I held back, keeping my eyes fixed on the top part of the sign: "Yentna Station." "We should probably keep moving," I said. "Anne kept going." Beat agreed that we should probably shouldn't fall too far behind Anne, but asked me if I wanted to go in and get warm. I did, but still hesitated. How could I explain this? It was Yentna Station where in 2009 I struggled in front of a weak wood stove, trying to remove the boot that had frozen to my foot. It's where I endured the agony of thawing frostbitten toes and coped with the crushing disappointment of dropping out of my second ITI 350 and ending my great Alaska adventure before it even really began. The proprietors at Yentna Station were nothing but nice to me, but it's still difficult to return to the place where I spent one of the worst nights of my life. Beat saw my face and understood. "You don't have happy memories here, do you?" The miles rolled on. Beat and I didn't talk much, retreating into our introspective worlds that close in amid these expansive landscapes. The clouds began to thin and the weak December sun made its lazy arc over the southern horizon. 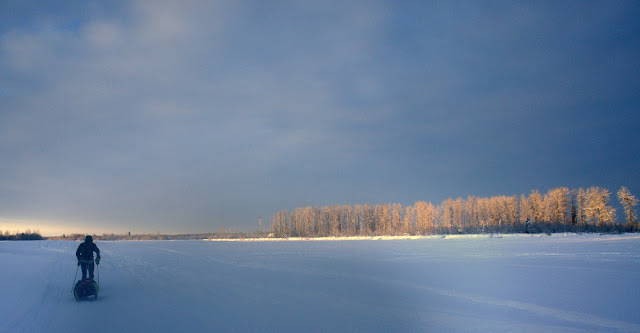 I watched the golden orb creep beside me through the tips of frost-crusted birch trees, casting its heatless light amid a skeleton of shadows. The weak rays were already trending downward, the sun setting without even making a real effort to rise. It made me think of a visit from an old friend, someone I no longer knew well. We shared a brief, superficial chat and parted again too soon, filled with a sad sort of yearning for the days when we were close. Silence held on throughout the day. We only saw a handful of snowmachines, freight drivers hauling loads of fuel and lumber at creeping speeds, although not as slow as us. They all gave us friendly waves but let their helmet-masked gaze linger for a few too many seconds, no doubt intrigued by these odd ice-crusted figures trudging up the river. I have been told that the "bush" Alaskans who occupy this region are often suspicious of human-powered travelers, uncertain of their motives and baffled as to why we'd choose such an obviously inferior method of travel. Dog teams have carried humans up these valleys for centuries. The "iron dog" snowmachine added even more power and efficiency for a fraction of the effort. Bush pilots buzz overhead in ski planes that can land and take off from any snow-covered pond. Humans have always been weak and slow, and no one is so poor or needs to travel so badly that they should venture out on foot at 35 below. And yet I felt inexplicably, almost mindlessly, happy. 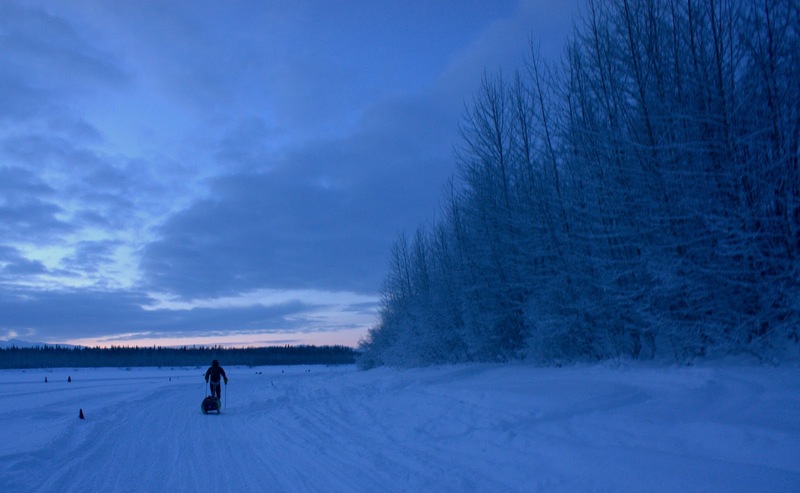 I sometimes glanced back at my sled, still trailing behind me like the loyal pet I was beginning to picture it as, even though its runners still scraped across the snow like two pieces of sandpaper. 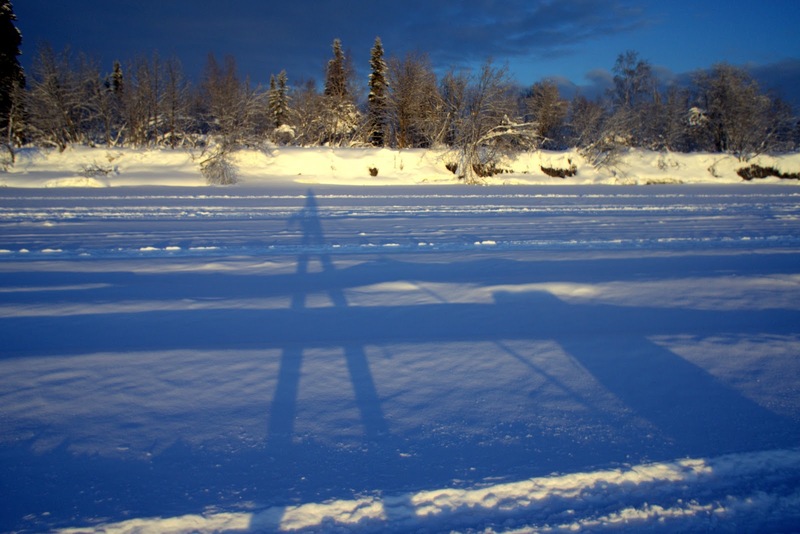 My shoes and poles squeaked loudly in the cold snow. It made me think of a friend chatting amicably but nonsensically, which was all right with me, because I wasn't really in a frame of mind to listen to words. My thoughts were often as blank as the river snow, thinly cut with a trail of memories. I simply breathed and walked, breathed and walked, and when the happy started to slip away, I stuffed another piece of icy candy into my mouth. Beat for his part seemed to be enjoying himself, and commented that it was "heating up" even though I'm pretty sure it was still 20 below. 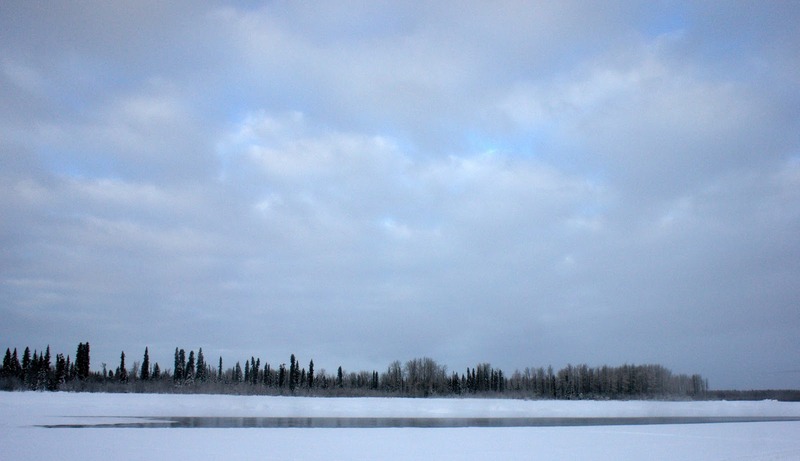 Twenty miles went by without a sign of a lodge, and the daylight again began to disappear. Anne was now far enough ahead that some snowmachines had gone through after her, and we had a difficult time picking out her footprints. The wind began to pick up and for the first time all day, I felt a chill. I reached to zip up my Gortex coat and realized that my primaloft sweater was fairly wet. The wicking fleece jacket below was still dry, but the sweat had all consolidated in the puffy sweater. This wasn't a disaster. I could always take it off and let it solidify to an ice ball, then put on one of my dry layers if I was still cold. But the essential loss of the puffy was a bit of a mental blow, given our plan to camp out that night. I was quickly reminded of the universal truth — that no matter how well things are going in Alaska, they can turn bad in the blink of an eye. Things certainly hadn't gone bad yet, but the razor-thin closeness of potential diaster gave me a jolt of fear. We were 28 miles from Luce's Lodge when we saw a sign on the other side of the river. I waded over to see an advertisement for the Northwoods Lodge, and another that said Skwentna — our potential destination that night — was still 12 miles away. We had originally planned to bivy somewhere in between, but darkness was sinking in and carrying with it new ungodly cold temperatures. We walked a mile up Fish Creek to find the lodge and Anne, who arrived forty minutes before we did. I removed my layers in a shower of frost as Anne informed us that the lodge owners believed temperatures out on the river would reach 40 below or lower overnight — the outer limits of our sleeping bags and definitely in that "struggle to survive" zone. "And, well," Anne said. "They knew we were coming up the river and they already started heating a cabin for us this morning. I don't know about you guys, but I don't have to practice being miserable." It was settled before it was settled. This was, after all, our vacation, and setting back out to camp on the river when there was a perfectly good cabin at our disposal would only confirm our craziness. I couldn't wait to get my hands on some hot chocolate. I just picked up a copy of Unbreakable: Western States 100 on DVD after seeing it in the latest Runner's World. I think your ex, Geoff, is in it. Kind of excited to watch it!!! Awesome! The warm cabin sounds soooo nice! That was nice of them to heat the cabin for you. Pretty blue pictures! Wow, that's COLD. Smart move on taking the cabin. I loved your description of the sun rising/setting in Alaska as a visit from an old friend you no longer knew well. Great post! Such a great piece of writing. reads like a novel and I found myself willing you on and wondering what you were doing next. Rest assured that doesn't happen with all blogs i read! Love the photos! I do have a question with footwear: you mean neoprene socks when you say "Vapor barrier socks" right? I like the paragraph about the bush Alaskans. Historically, most people that stayed outside that long at -35 were taken care of by evolution; so someone that does it for recreation is looked as death(literally) crazy. Actually they are NOT neoprene socks. I dislike neoprene a lot (especially socks) - it gets very wet and absorbs a lot of moisture and then is very cold. If you're not sweating I presume it's fine, but Ieverytime I used neoprene in a running situation I found the performance absolutely abysmal - though your mileage may vary, as always. Neoprene works in water because it keeps the moisture at a particular temperature and pretty much works as a "wet insulation" I think, but in the very cold it's very bad if it's wet. For an outer insulation, like an overboot, it's fine I think, since you don't get in contact with it. There are special socks from RBH Designs and some other manufacturers. They're basically thin fleece layers lined to a non-breathable membrane. Some people also use stuff sacks to achieve the same result, though they may induce a lot of slippage. VB clothing is based on the principle that evaporation cools, and thus you don't want any breathability at all. Also you notice right away when you sweat, which is something you don't want at all. The result is often a clammy and uncomfortable feel, however - it stays clammy instead of freezing cold. The other big point of VB is that it keeps your sweat from making the insulation wet - which is huge. Extreme cold is definitely different than just cold, because moisture really doesn't go anywhere before freezing, so anything breathable doesn't actually work. I only use VB layers when regular layers fail because I sweat so much. Instead, I generally try to run cool, which is a bit dicey. 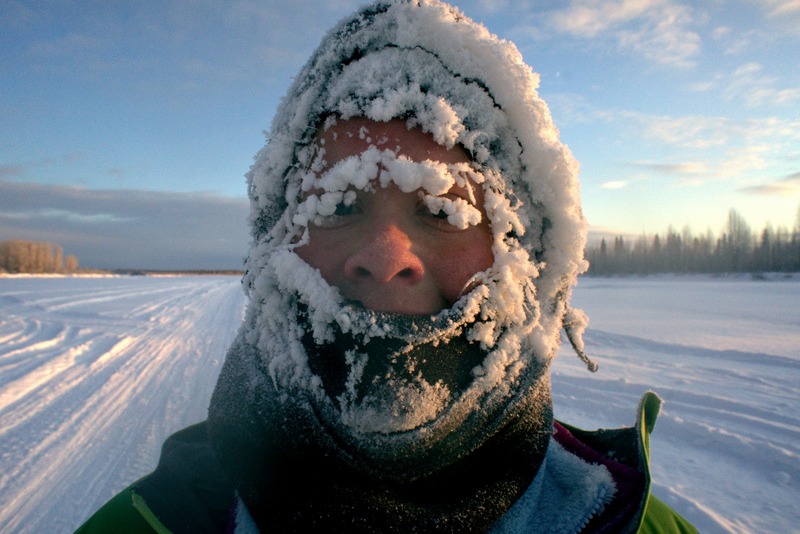 During the -35F run, I only had a thin baselayer, a thin windshirt and my gore-tex jacket as layers on my body. 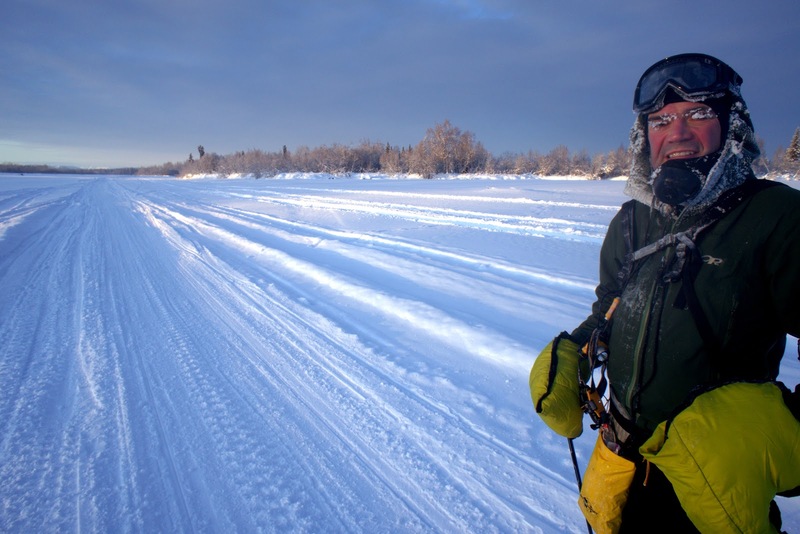 I was chilled, but I started out with a primaloft layer and that got me sweating right away ... I probably could have done with just one VB shirt and the jacket as well. Wow, beautiful! That is one epic way to spend new year. Every time I read your posts it makes me want to get outside and do something, heres hoping I manage to do a bit more of that this year. Also, while I think about it-do you ship your books to the UK? Ok, so this may sound like a dumb question, but here it is: How are you able to SEE with ice like that on your lashes? Wipe it off frequently? Anon — actually that's a good question. The ice-lashes do obstruct my vision. I'd compare it to looking at the world through a frosty tree branch. And it's thick ice; I can't pull it off without ripping out eyelashes. I sometimes used my hands to try to thaw my eyelashes, but my fingers usually became numb before I could melt all the ice. Goggles prevent this but it's difficult to keep those from icing up completely, especially when I wear my balaclava over my mouth the way I do. I do that so I can breathe warm, moist, recirculated air. This not only keeps my lungs happy but also warms my entire face. The drawback is the ice buildup on my facial hair. I actually got a tiny bit of frostnip from those ice-eyebrows. My skin still stings a bit. Breathing unobstructed air is painful, and at temperatures below -40 can start to damage your throat and lungs (possibly above as well, or at least you'll end up coughing like you smoked a couple of packs!). I actually got a face mask which you can see me wear which mixes inhaled and exhaled air (and thus significantly increases the air temperature) and prevents this - it also directs the air to the front, preventing fogged goggles. However, I found it more comfortable to use my fleece balaclava, which tends to form an iced up breathing chamber that has very much the same effect. It's just easier to vent that way. 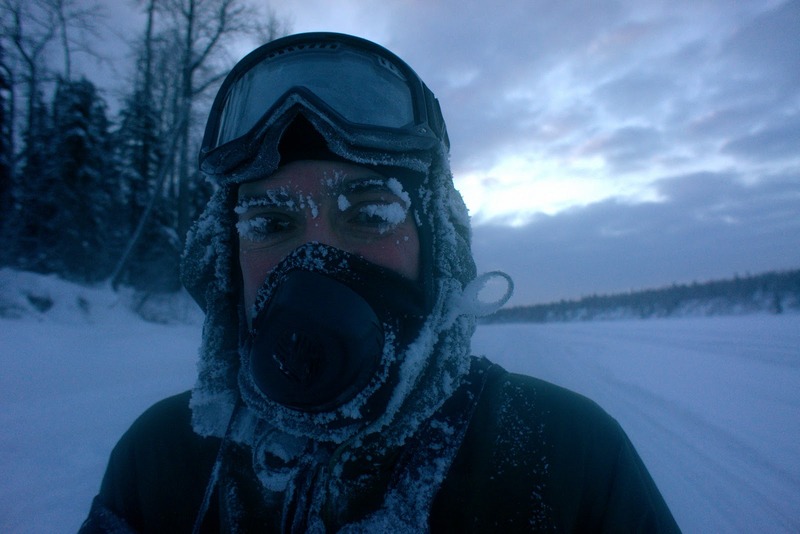 Also, when there's not much wind, the exhaled air forms a nice warm air blanket for your face and eyes, providing significant protection (at the cost of ice buildup). I'm still gonna bring the mask for windy conditions, but one then has to protect the exposed skin between the goggles and that mask somehow (like with tape or vaseline). Thanks for the info! I've never tried these. Usually I layer various thickness Smartwool socks and that works pretty well. 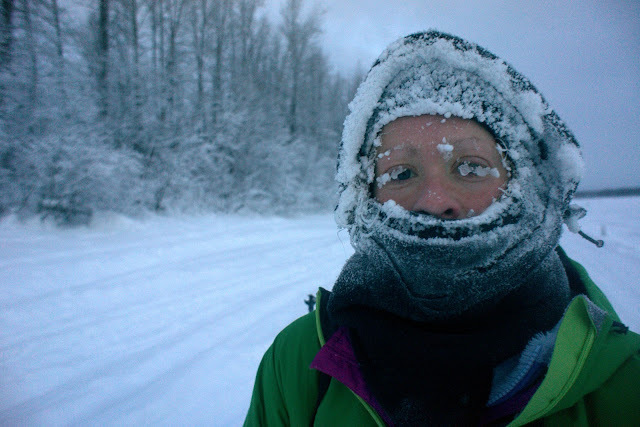 I have a neoprene face mask that I layer with a fleece neck gaiter outside for anything below -30. Keeps my breath warm and vents a bunch of the exhaled air straight out instead of up to my eyes. It actually looks sort of similar to the one you are wearing. I also struggle to stay dry because I sweat a lot too. I usually go really heavy on the mittens and lighter on the shirts and I'm good. Such descriptive and fascinating writing! You are the best writer I've ever read. A true pro. I've been reading your blog for number of years. I forgot how much I really enjoy your snow pictures. I've never been to Alaska and always enjoy seeing it thru your lens. Really enjoying "armchair" traveling with you and Beat this year (or last year?!). Wishing you both the best for 2012. Thanks for the information on the clothing. I have a hard enough time figuring out what to wear when I go out on a run when its 20deg above freezing, especially when it is windy. Beat makes a good point, but I believe the temperature that can harm you lungs is much higher then -40. In cross country skiing anything below -5 they cancel the race. Below this temp I make sure to wear something over my face. Jill your writing is so great!! When I ski to these places it is amazing but you make me enjoy them even more when I read of your adventures. I wasn't sure if either of you are using a vapor barrier shirt / pants over top of your thin poly and underneath more puffy insulation? My experience in winter trips (in far milder temperatures in Maine) are that I arrive soaked from perspiration, despite the use of fleece and quick drying fabrics. It's both uncomfortable and tiring at the end of the day to be dealing with wet clothing that needs to be removed quickly in order to set up an evening camp. My usual strategy is to always have all garments with full zips that allow ventilation, but the sweat still accumulates after a few hours. In Michigan, I don't experience the extreme cold you guys face, but I ride my bike daily throughout the winter and therefore need some gear similar to yours. I need something to allow me to breathe pre-warmed air, but has free exhalation. Wearing a simple cloth balaclava is no good because I end up waterboarding myself with the wet or frozen cloth over my mouth! The heavy breathing on the bike renders unusable many items that would otherwise be OK in lower-intensity activities. I was wondering about your mask with the cup over the mouth area - it appears to be the Talus ColdAvenger. My wife bought one of those for me, but I have yet to use it. I've read many bad reviews. How do you like it? Do you use the foam nose bridge strip? Do the vent slots freeze up? Thanks in advance. I love the blog and especially the photos.